In December 1922 the Irish Free State came into being, and within months it had applied to join the League of Nations, the multilateral organisation created by the postwar Paris peace conference in April 1919 to oversee international security and disarmament. Based in Geneva, its creation was a direct response to the First World War, as it was tasked with ensuring that there would be no recurrence of such a devastating global conflict. For the Irish Free State, the League of Nations had an added significance. While the British-Irish relationship was of paramount importance for the new Irish state. Ireland’s participation in the League of Nations was shaped, to some degree, by the desire to carve out an international niche for Ireland distinct from the sphere of British influence that Ireland was, at this time, still a part of (indeed, admission to the proposed League had been one of the demands of the Sinn Féin mission to the peace conference in 1919, as the first Dáil Éireann unsuccessfully sought international recognition for Irish independence). Our April exhibition, co-curated with our colleagues in the National Archives of Ireland, deals with Ireland’s decision to join the League of Nation in 1923. Amongst the documents in display in the exhibit are a letter from Michael Collins expressing his wariness of joining the League, dated 22 July 1922 (a month before his death in the Irish Civil War), and a memorandum by Kevin O’Shiel (the legal adviser to the Free State government) setting out the case for membership; Ireland’s application for membership was submitted the following month, April 1923. Also in the exhibition is the picture featured above of Ireland’s delegates to the League Assembly in September 1923. 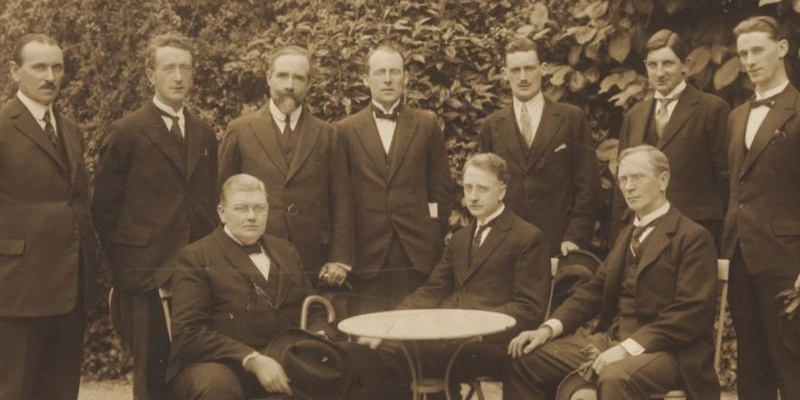 Front, seated: Hugh Kennedy (Attorney General), William T. Cosgrave (President of the Executive Council) and Eoin MacNeill (Minister for Education); standing (L-R): Michael MacWhite (Permanent Delegate to the League of Nations), Desmond FitzGerald (Minister for External Affairs), the Marquis MacSwiney (Delegate), Kevin O’Sheil (Delegate), Ormonde Grattan Esmonde (Delegate), Diarmaid O’Hegarty (Cabinet Secretary) and Joseph O’Reilly (aide-de-camp to Cosgrave). The League of Nations was dissolved in the aftermath of the Second World War (a process overseen by its last Secretary General, the Irish diplomat Sean Lester), to be replaced by the United Nations. The League of Nations was the first multilateral organisation joined by independent Ireland; it would not be the last. Image courtesy of National Archives of Ireland.